Here at Resmar we are experts in the field of safety equipment and we searched the market for the ultimate in quality, reliability in terms of all in one resuscitation kits. Marine Oxygen Resuscitators There are 2 products. These advanced kits have been specially designed for first responder to rapidly deliver optimal levels of oxygen to the casualty. They will maintain constant and regulated ventilation through an advanced pressure and flow sensing system. With easy, one button operation they dramatically reduce the complications associated with time-cycled devices and bag valve masks. These kits assure a constant flow rate and safe pressure limit during inspiration, and allow for passive exhalation. 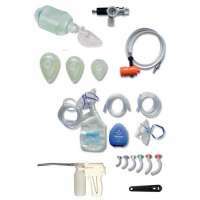 They have the smallest possible number of moving parts, are easy to clean and assemble and feature audio and visual airway obstruction indicators, and are designed to reduce the risk of gastric insufflation and barotrauma which is known to occur with the use of bag valve masks. Eliminating breath stacking which is associated with time cycled ventilation they allow a much more efficient use of oxygen as a power supply. On the FR300, the resuscitator head is connected to a single medical oxygen cylinder and on the RM2-500 the head is connected to two cylinders. And has an automatic changeover valve. 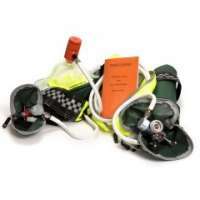 Both systems with their masks, airways and instructions cards are packed into purpose - designed patient harnesses, which, when fitted to the casualty, are intended to leave the medical team hands free to assist in a rapid evacuation. The two mask/cylinder system is designed to allow extended transit time for the casualty which is particularly useful in the case of a marine application where immediate evacuation may not always be possible. We have a number of training seminars in the use of all of our emergency escape and breathing apparatus units and kits, as well as offering full after sales and support with regards to refills and replacement parts when required. Our staff are highly experienced in this field and are there to help you to make the best decision, call us for a chat if you are at all unsure of what unit best suits your individual needs. Click through for more detailed descriptions of these kits.